Everything on this website is free. Create your free account for life and get online reservations and table management software, online menu software, website & mobile website , e-mail marketing tools, gift card selling and e-gift card selling tools online - all free. No wonder Restaurantry is world's largest free online tools provider for restaurants. Free online Reservations. Free Website & Mobile Website. Sell Gift cards and e-Gift cards online for free. Accept reservations from your website(website is free), facebook or mobile website(mobile website is free) and build customer database. Advanced customization and table management with integrated special offer bookings ensure your otherwise slow days get more diners through online reservations that are instantly confirmed. 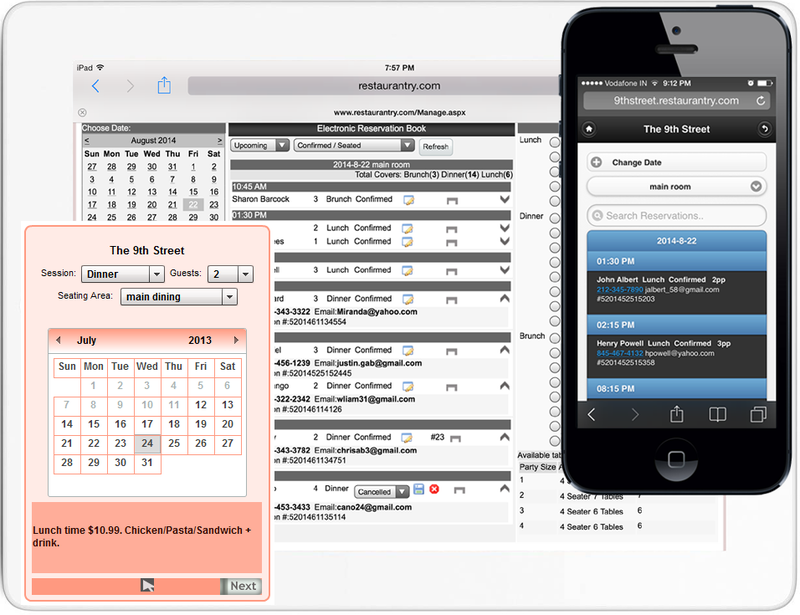 With multiple seating ares, integrated birthday and anniversary information collection, integrated special menus, and total control on reservations, complete customization and no third party re-direct, we believe that Restaurantry's restaurant reservation software is industry's most advanced reservation software. Schedule and send e-mail marketing campaings to your opt-in customers built through reservations. Use templates or create your own marketing campaigns and send your specials,coupons,offers etc., to unlimited guests daily. Upload images and manage content of the campaign. There is no fee for our e-mail marketing software. With secure e-mail sending practices, your e-mail will be directly delivered to the recipient's inbox and never to spam folder. Through marketing campaigns, keep your diners updated with specials. Increase your brand's visibility, diners and revenue. Please note that only and only the opt-in guests (unlimited) can be emailed to avoid spam. Sell Your gift cards for free with your Paypal account. Restaurantry provides free software so guests can send your physical gift cards to their loved ones. Sell unlimited cards for free with your Paypal account. Store and manage gift card orders for free. Every transaction is stored. We do not charge any fees. Get world's most advanced content management sytem for restaurants that is 100% free with every account. Get a free website, free mobile website and create online presence. Manage every aspsect of your website content your self, at any time. Create and manage unlimited menus, special offers, directions, hours, happy hour and any information you can imagine. Create unlimited pages for your website. Be found on search engines like google with advanced search engine friendly URLs. Accept reservations from mobile phones.